A new generation of variable blaze transmission gratings is being used in telescope instrument packages to simplify spectrograph design and improve light collection efficiency. These volume holographic phase holographic gratings (VPHGs) allow the use of near straight through spectral imaging so that collection cameras can be larger and closer to the grating. Prisms and AR coated windows are easily index matched to volume type gratings and no delicate surfaces are ever exposed to the elements. Spatial frequencies above 4000 l/mm are easily realized without anomalies or losses from form factor. 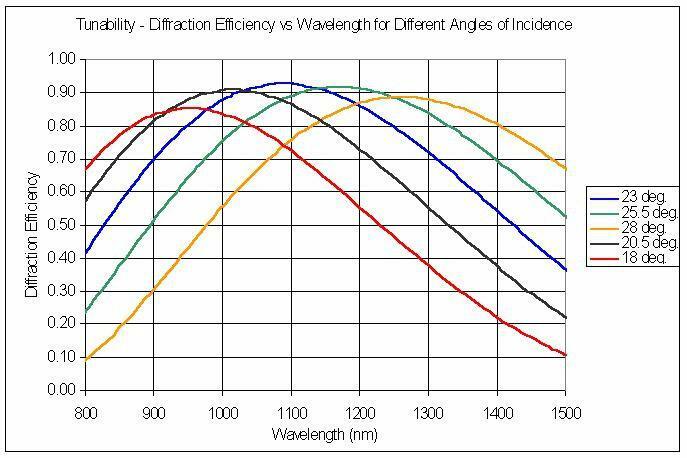 Efficiencies for S (TE) and for P (TM) can be as high as 95% while diffracting through a 93 degree full angle (46.5 degrees half-angle) in the special case of a Dickson® Grating. All gratings are made in hardened, baked, and environmentally stable dichromated gelatin (DCG). The gratings are sealed with glass on both sides resulting in a rugged, scratch-resistant, easily handled product. They may be cleaned with soap and water. Additionally, these VPHGs allow for relatively large Bragg angle tunability. An example is shown below for a 1085nm grating at 720 lpmm. To learn more about these types of gratings, see our tutorial on Fabrication and Testing of Larger Area VPH Gratings. Or, let us design a custom grating for your application.